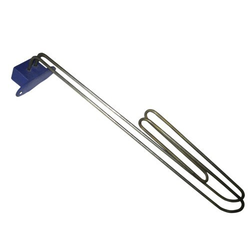 We are a leading Manufacturer of alkaline immersion heaters and alkaline heaters from Delhi, India. We are the topmost company involved in the manufacturing, supplying, trading, service providing, importing and exporting Alkaline Immersion Heaters. We have manufactured this qualitative range by making use of optimum raw material and latest technique. These are suitable for alkaline cleaning solutions and chemical tanks. To add on, these have superior functionality and high durability. Last but not the least, these heaters are offered at budget friendly rates to our dear clients. Our company is among the best known companies which are involved in the manufacturing, supplying, trading, service providing, importing and exporting Alkaline Heaters. Advanced technology is used while making these heaters which have outstanding quality and high durability. These are extensively used in many applications such as solvent vapor cleaning, electroplating solution, oil heating, chemical tank and others. Moreover, these heaters are offered at industrial leading rates.